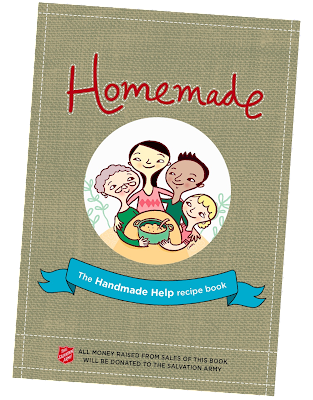 If you haven't already ordered your copy of Homemade: The Handmade Help Recipe Book I encourage you to pop over here and grab one. A tasty $8 for the pdf or $15 for a paperback copy with 100% of proceeds going to the Salvation Army. In February 2009 Victoria was victim to the worst bushfires on record, which wiped out entire communities, caused 173 deaths and left thousands without homes or shelter. The Handmade Help Recipe Book evolved as part of handmadehelpsout.blogspot.com by a group of crafters and artists who wanted to contribute to the recovery effort. The result is a truly international cookbook, packed with treasured recipes and family favourites, donated by people across the globe who wanted to help including well-known chefs such as Margaret Fulton, Allan Campion and Michele Curtis. I love recipe books. Thanks for the tip. Lisa. This looks wonderful! Thanks so much for sharing. I've ordered mine - can't wait until it's printed and I have my copy!! You can save money on grocery shopping by using grocery coupon at www.clickmycoupon.com and get discount offers.